(MIRAMAR, Fla. and IRVINE, Calif., Jan. 3, 2019) - Hytera, a leading global provider of innovative Land Mobile Radio communications solutions, recently unveiled the VM682, a unique device that captures, stores and shares media from the field including audio, image and video evidence. The VM682 is designed to operate standalone or as a bodycam/speaker microphone for the Hytera DMR handsets including the recently introduced PDC760 multi-mode advanced radio. The rotating camera head, capturing high definition 1080p video at a rate of 60 frames per second and boasting an IP67 rating, makes the VM682 body camera ready for front-line action. Body-worn video cameras are a vital asset for gathering valuable evidence during critical situations. The Hytera VM682 is useful across any market sector but especially where staff members interact with the public or for lone workers, including at schools, event venues, sports and leisure facilities. The VM682 dramatically improves situational awareness, information gathering and evidence collection in the field. "Hytera's VM682 is specifically designed for optimal use in tense situations and offers the features that my customers need, like one-touch record buttons, simple menu options, long battery life and covert mode," said Sherrill Belew of Area Wide Communications in Medina, TN. "When using the VM682, users can be certain that the evidence captured is accurate and representative of how events unfolded." Visible body cameras can increase the safety of your employees and the people with whom they interact, fostering a more trusting relationship with the public. The VM682's innovative design offers dual microphones to capture clear audio and a camera with automatic infrared technology that can adapt to low light conditions. The body-worn camera with remote speaker mic allows users to initiate and receive voice communications, initiate an emergency alarm, and deliver real-time video to a control center. With a simple, intelligent design, the VM682 provides one-touch operation for video capture, voice recording and emergency calls. This lightweight device boasts a 180° rotatable and 140° wide-angle lens, a 16-megapixel image sensor, six infrared LEDs and extensive battery life that can continuously record up to six hours. The VM682 offers several storage capacities up to 128GB, which is equivalent to 44 hours of 1080p recorded footage. With an intuitive Graphic User Interface (GUI), users can review, manage, and share data simply and efficiently from your PC. To ensure the content captured remains tamper-proof and secure, operators can dock the device in the charger to export audio, video and other data to the evidence data management (EDM) platform. Additional connectivity is available via Wi-Fi to push information and support programming. 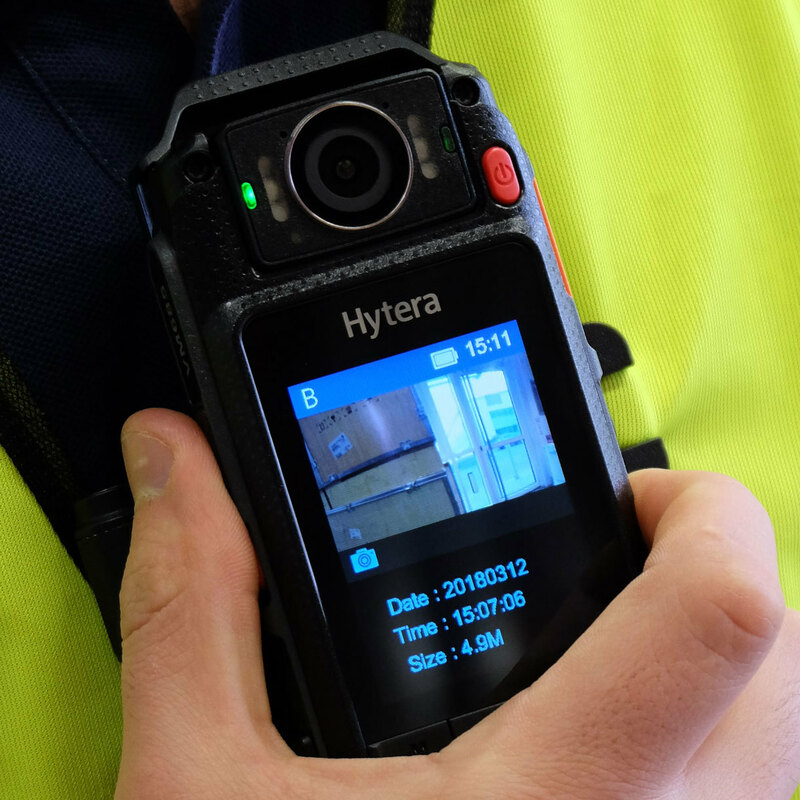 "Whether working alone or in crowded areas, VM682 users across dozens of industry sectors managing on-the-ground situations can ensure they are securely capturing evidence," said Steve Cragg, VP Sales, Hytera America, Inc. "The VM682 body camera, when used in conjunction with our multi-mode advanced radios, allows Hytera to provide a comprehensive, feature-rich solution for capturing video and audio evidence in any scenario."